I’m an unlikely homeschooler, if there ever was one. It was not my original intent to homeschool my children, but nearly four years in now, I am a “true believer”. There was a time not so long ago when the thought of spending practically all of my waking hours with my children was overwhelming. 5 years ago, I was the mom selling her husband on the idea of sending our just turned four-year-old to preschool because I felt I desperately needed a break already. It had been a difficult year adjusting to having two children. I spent most of my days feeling completely at my wits end, dealing with a very needy infant who refused to nap during the day and suffered from chronic acid reflux, and a toddler who reacted badly to getting the short end of his mother’s attention. Now I can’t imagine not getting to teach them every day and see their love of learning come alive. It has enriched my life and grown my faith in ways they will probably never fully realize or appreciate. The buck stops with me concerning my children’s academic and spiritual training. The very nature of homeschooling is that I am actively, intimately involved in all aspects of their education! I research curriculum, educational methods, and teaching resources. I find new and exciting ways of engaging my kids in what they’re learning, and make sure everything is taught from a biblical worldview. I’ve become a more consistent, focused spiritual trainer. There have been countless opportunities to speak God’s truth into my children’s lives, and teach them Christian values and belief system. We are able to really dig in deep with our daily Bible reading and study. During prayers or while listening to worship music throughout the day, my son has often asked questions about what he heard, which then sparks a great discussion. Those spontaneous conversations probably wouldn’t have happened if we were rushing around trying to get ready in the morning, or if he was away at school for six hours each day. It would seem that the more time they’re with me, the less I would actually enjoy them, but the opposite is true. I found it’s much easier to delight in my kids when I get to see all of their day, not just a few hours before and after school. I only developed that desperate need to be away from my children when I sent my son to preschool. That addictive need for “me time” took hold very quickly. 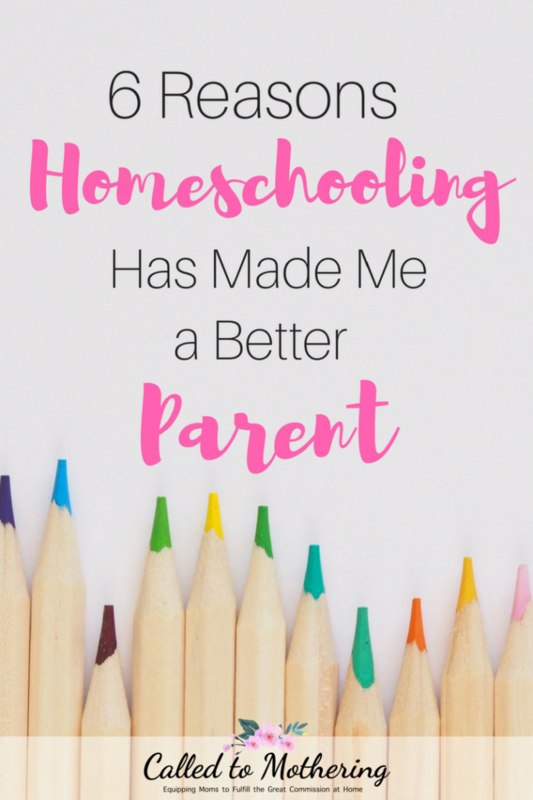 When we started homeschooling and I dedicated myself to the job full-time (as opposed to living for those moments when I could drop him off), things became easier. And since I basically observe my kids all the time, I have come to truly appreciate their unique giftings and strengths. I’ve witnessed firsthand their creativity, problem solving, and kindness towards each other daily. No one else is getting the best of my child all day long, with me getting the leftovers. Because I am with them practically 24-7, I’ve been able to zero in on exactly what character issues they struggle with. More time together for character training, as well as Bible study and meaningful conversations, equals less chance for bitterness, grudges, or bad attitudes to grow or linger. Disrespect can’t fly under the radar as easily. Any behavioral problems that come up can be dealt with as soon as they happen, and disagreements and hurt feelings can be worked out more thoroughly. 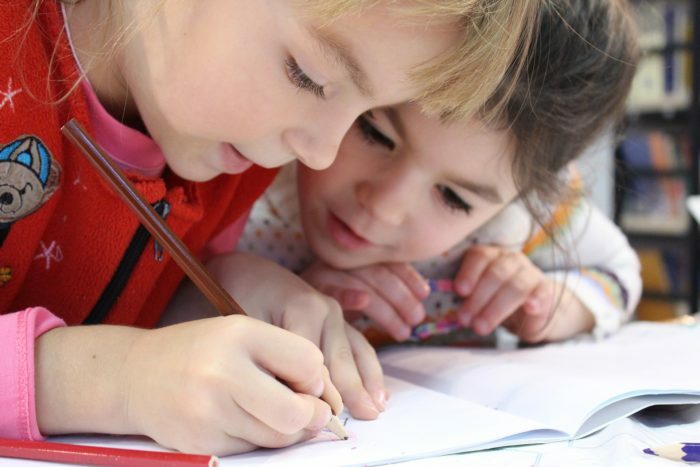 My kids have also learned how to cooperate with each other because they’re not separated in different classrooms all day long, making for a more pleasant home and school environment. These opportunities to be intentional and attentive with them has created more of a bond and mutual respect between all of us, too. The work of homeschooling is producing the fruit of patience in me. I am being stretched by God to do something I don’t have the strength or ability to do on my own. We’ve all heard that suffering produces endurance (Romans 5:3), and homeschooling is no different. Being right there with my children every step of the way to encourage and teach them is growing in me a patience I never would have had otherwise. There have been moments of sheer hair pulling frustration, but the rewards when the breakthroughs come are amazing! I’ve gotten a glimpse of God’s long suffering nature with His people by sticking with my son and daughter through their problems with reading or math and difficult attitudes, when it’s hard and doesn’t produce the instant results I want. Since they’re not separated from me for a good chunk of each weekday, we have lots of time to spend together. I know it’s not about quantity, but with more time comes more opportunities for quality time, if you’re intentional about it. We have made such special memories through all of the learning that takes place in our home. Together, we have wrestled through decoding words, studied scripture, traveled back in time to ancient lands, snuggled up with great books, visited fascinating places around the globe, and created some pretty cool projects. All the discussing, observing, creating, and designing that takes place here on a daily basis would be missed. I truly believe that being away from my kids for several hours, five days every week, would disrupt our relationships in ways that make me sad to think about. By mothering practically 24-7, my weaknesses have more of a chance to come to the surface and be dealt with. All those ugly habits and traits are exposed as I’m constantly living in front of them. As with patience, God is growing the fruits of kindness, gentleness, and self-control, refining me daily. And I know if I want to be able to teach my children good character, I have to model it before them. They will display the qualities that they see in me. I need to be intentional about my walk with the Lord so I can sow the right kind of seeds in my kids. Sometimes I think homeschooling is really more for me, than it is for them!